Illness on one's request is now one of the greatest social problems. 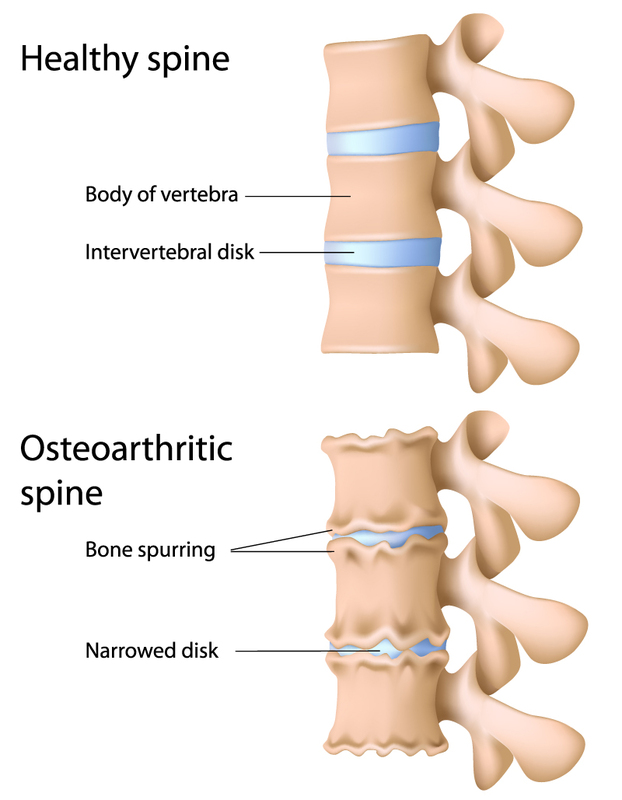 Degenerative changes of the spine refer to the premature wear of the tissues forming the functional connections of the bony elements in the spine , that is, intervertebral discs (spondylosis , spondylosis deformans) and the small facet joints (spondyloarthrosis deformans). Usually both forms occur simultaneously. Very often, degenerative changes of the spine concern people working in unphysical/unnatural positions, maintained during work. A prolonged unnatural body position during work and lack of even recreational sport can be fatal in effect. It is worth noting that despite all that the base of degenerative changes in older people is age. All of the aforementioned factors have a direct impact on the condition of the spine, especially lack of movement. The beginning of the disease is very slow and not very noticeable. The first and basic symptom of degeneration of the spine is pain, which has a different character and course. Stiffness after waking up in the morning - associated with degenerative changes within the joints. The sick person must initially warm up to be able to function during the day. Pain - it can also occur after a long-term forced position of the body, such as office work, or working on the production line. Pain may be accompanied by an increased defensive tension of spinal muscles, which in this situation also become painful. Statistical data are alarming. Changes in the spine lead to anatomical joint damage and impaired motor function. Changes may be secondary to the inflammatory process of the synovial membrane. Let's remember that in today's times of fast-pace and intense work, the disease is very widespread and the first symptoms are recognized already in people aged between 20 -30 years of age. The most common cause associated with sciatica is a slipped disc, that is the intervertebral disc. This can happen even during standard bending, though usually this is due to an overload of physical activity or previous spinal injuries. The patient avoids the movement of the spine, in the case of a chronic course, the disappearance of muscles especially in the lower leg occurs. Very often, 'sciatica,' or rather the symptoms associated with it are called 'root attack', which has absolutely nothing to do with reality. Still, it is difficult to compare sciatica attacks with any other condition. It is a really sharp pain, whose total center is located below the waist and radiates to the very foot through the buttocks and hip. In the majority of cases, conservative treatment is used, that is. non-invasive and one which does not require a surgical intervention or a hospital stay. There is not one 'miraculous' way to discopathy. A specialist should always choose methods that do not exclude each other and whose combination leads to improved health. In sharp conditions, the patient lies on a stiff, rigid and level substrate in a decompressing position where we do breathing exercises, isometric exercises, upper limb exercise, foot training. The spine like any other organ in our body wears out over the years. Discopathy has a progressive character, changes cannot be reversed. However, we can mitigate the symptoms and save ourselves pain if we properly take care of it early enough. Prevention has key meaning as in any situation, an early response is sufficient to avoid many problems, in this case it helps to avoid pain. Never underestimate the symptoms of back pain. Regardless of age, we should remember about physical activity that strengthens the muscles, and these in turn can sustain the entire skeleton thanks to their durability. In the age of a 'fast' life and constant work we forget the most important aspect of life for which we were 'programmed' - physical activity. Contemporary medicine and science offer different supplements, take a closer look at them and choose the right one for you. A supplement rich in hyaluronic acid and chondroitin can help effectively prevent the development of degenerative spondylitis. Thanks to the mechanical properties of these substances it is possible to absorb the forces acting on the joints. 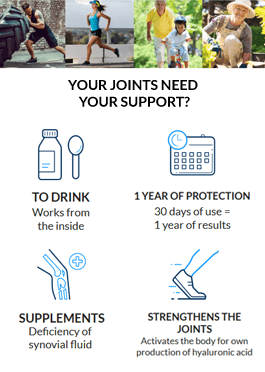 Chondroitin promotes articular cartilage regeneration, and hyaluronic acid guarantees hydration of the articular cartilage surface and replenishes arthralgia. The comprehensive effect of the supplement reduces pain, increases the range of movement and thus improves the comfort of life.